Overview: Boston's oldest neighborhood is teeming with culture and activity. While the North End is home to people from across the globe, it is most well-known for its prominent Italian-American presence, as demonstrated by the dozens of amazing Italian restaurants, bakeries and markets in the area. Location: The North End is a peninsula surrounded by Boston Harbor to the eastern north and south. This neighborhood is best accessible on foot because of the area's narrow streets and high popularity. Neighborhoods near the North End include the West End, Historic Boston, and the Waterfront. Culture: With many fantastic restaurants, important historical sites, and a beautiful waterfront, the North End is a great place to live. It is very close to several cultural attractions including Faneuil Hall, the TD Garden and the New England Aquarium. 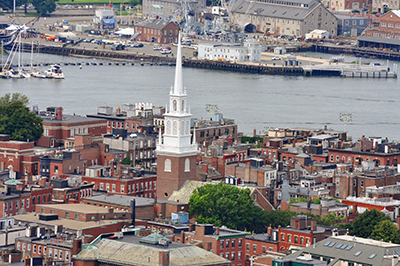 Notable Places: Old North Church, the Paul Revere House, Christopher Columbus Waterfront Park. Below, explore all luxury homes for sale in Boston's North End. Be sure to register an account so that you have the ability to save your favorite listings and get notifications when similar properties enter the market. You can also search Boston area real estate using our advanced search tool. I have a question about the property at 11 Wiget Street Boston MA 02113 (#72486139). I would like to schedule a visit for the property at 11 Wiget Street Boston MA 02113 (#72486139). I have a question about the property at 357 Commercial Street Boston MA 02109 (#72457199). I would like to schedule a visit for the property at 357 Commercial Street Boston MA 02109 (#72457199). I have a question about the property at 40 Fleet Street Boston MA 02109 (#72478929). I would like to schedule a visit for the property at 40 Fleet Street Boston MA 02109 (#72478929). I have a question about the property at 40 Fleet Street Boston MA 02109 (#72478930). I would like to schedule a visit for the property at 40 Fleet Street Boston MA 02109 (#72478930). I have a question about the property at 121 Portland Street Boston MA 02114 (#72461770). I would like to schedule a visit for the property at 121 Portland Street Boston MA 02114 (#72461770). I have a question about the property at 115 Salem Street Boston MA 02113 (#72452348). I would like to schedule a visit for the property at 115 Salem Street Boston MA 02113 (#72452348).